Dean Atlantic HDFC received property tax exemption for seven buildings. On August 21, 2014, the City Council voted 47-0 to approve an Article XI property tax exemption on seven buildings owned by the Dean Atlantic Housing Development Finance Corporation. The Department of Housing Preservation and Development requested the exemption from the City Council on Dean Atlantic’s behalf. 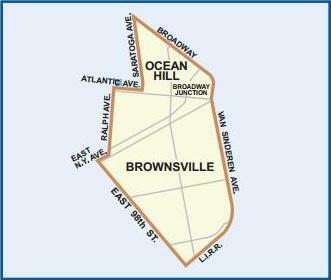 The buildings are all in Brooklyn Community Board 16, covering the Ocean Hill and Brownsville communities. Six of the buildings are located in an area bounded by Atlantic Avenue to the north, Dean Street to the south, Rockaway Avenue to the west and Eastern Parkway to the east. The seventh building is located further south at the corner of Park Place and Saratoga Avenue. The buildings are either two-or three-stories for a total of twelve residential units, with five of the buildings featuring a commercial space on the ground floor. The residences are two- and three-bedroom units. In 2006, the buildings were acquired from HPD and the United States Department of Housing and Urban Development by the Atlantic East & Dean/Saratoga Development Corporation. Atlantic East bought the buildings under HPD’s Neighborhood Homes program in order to renovate and sell the buildings as home ownership units to occupants who could receive mortgages and who would agree to live in the building for at least ten years. By 2009, the housing market had fallen and qualifying occupants under the program were unavailable, which led to Dean Atlantic purchasing the buildings in February 2012 for conversion into low-income rental units. At the time of Dean Atlantic’s purchase, some of the buildings carried a UDAAP tax exemption from HPD. UDAAP exempted the buildings from real estate tax assessments for up to twenty years, but not for the value of the land. By contrast, an Article XI exemption is designed for housing development finance corporations to provide low-income housing, and grants complete or partial exemption from all real estate taxes for up to forty years. Under New York City Housing Development Corporation standards, “low-income” housing is designated for individuals and families that make up to 60 percent of the Area Median Income, or AMI. On August 18, 2014, the City Council Subcommittee on Planning, Dispositions, and Concessions held a public hearing. HPD Assistant Commissioner Baaba Halm and Dean Atlantic president Dennis Taylor confirmed that eligibility for the rental units was capped at 50 percent of AMI, below the threshold of 60 percent, and would remain so after the exemption changed from UDAAP to Article XI. Council Member Darlene Mealy, whose district houses one of the buildings, said “[W]e do need affordable housing and [the tax exemption] would help those two families in that building.” The Subcommittee and the Land Use Committee voted August 18 and 19 respectively to approve the exemption unanimously prior to the full Council approving it as well. City Council: LU 0070-2014 (Aug. 21, 2014); Public Hearing LU 0070-2014 (Aug.18, 2014). By: Michael Twomey (Michael is a CityLaw Fellow and a New York Law School Graduate, Class of 2014).